Dont get me wrong, im all for giving kids a good foundation in eating the right things and being active but jesus christ! Theres one mam who makes her young teenage daughter do forfeits if she has a biscuit-50 press ups! The poor kid has to be weighed EVERY DAY, in front of her mam and is chastised and made to exercise harder if the scales show she has gained weight! Im so angry right now, there are ways and means of keeping kids not only healthy but happy too, but in my opinion shes doing it so wrong! Ooohoohh hello! Haha Sarah, I shout at the TV quite often. Morning All, so tired today and I really don't want to be in work. Don't seem to have any time to myself recently. Roll on the weekend and my days off! I've really got to get a move on with the first dread set I am making for myself for a gig the end of Feb. They won't be perfect, but I'm still learning and it will be nice to wear something I made. Hi everyone. I'm off today. Got a friend coming round for caffeine & a natter. This afternoon I'm going "modelling" for justapuppetonastring, AKA Shelly for her photography course. Should be a good laugh, I haven't done anything like that for about 10 years. Trying to figure out my makeup - the theme is winter. I'm thinking silver & blue. However, cannot decide on execution. I did get some nice skinny jeans though, and also she got me some zip up black wedge ankle boots. They're exactly what I've been looking for for AGES. Oh Liz, hopefully she'll turn up - keep us posted. So erm, my car broke on the a14 yesterday, cacked my pants a little. Needs a new gearbox, for those non-car types, it's going to be just over 700quid for me to fix it. So there goes every penny I've saved recently. Le sigh. No matter, it's all sorted for tomorrow and I pick it up Monday, bit skint now, but I've got my job etc and I'm all cozy. Phew. On the plus side, sorting out my new phone tonight and have a nice new dress for my friends party tomorrow, going to nab some heels off her, bwuahaha. 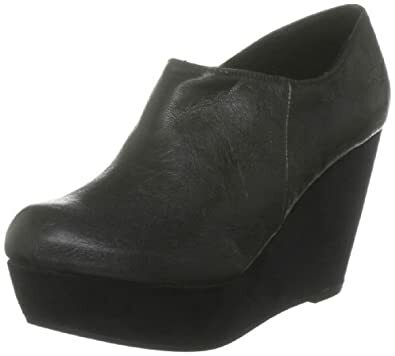 ScarletLady wrote: got me some zip up black wedge ankle boots. They're exactly what I've been looking for for AGES. Where from? Wanna seeeeeeeeeeeeeeeeeeeeeeeeeeeeeeeeeeeeeeeee!! I'm after a pair but keep finding fault with every pair I look at. I went with white, blue & sliver eyeshadow. I want exactly the same kind of boots too I have a nice pair at the mo, but they have a fur trim, so no good for Spring/Summer. I meant to dig my heels out of the loft as I've got a hankering to wear my shoe boots on Saturday when I go see Dani. I haven't done it though. Urgh...my back hurts from doing edgy poses :/ Still, the photos from what I saw looked awesome. DreadstarMonstar wrote: I meant to dig my heels out of the loft as I've got a hankering to wear my shoe boots on Saturday when I go see Dani. I haven't done it though. We shall send you some pics sugar. I really need to stop forgetting to eat, it's not exactly clever when you're hypoglycaemic. I need a round toe, a pretty decent wedge, but not too thin at the back, about 4 maybe 4.5" with a platform at the front & I'm looking for a particular shaped shoe too. I can see them in my head, but to no avail in a shop. BUT I would prefer black leather. Yeah, yeah. I know. Picky, picky. I'm much the same with boots, I want some flat boots with rounded toes, the closest I've found are at newlook, but they haven't got my size at the moment - grr! Have you checked the Blowfish range? They have some really nice ones in various styles. Round toes too!